My newest guilty pleasure TV show is Hoarders. The show focuses on people that fill their home - from floor to ceiling - with junk, trash, and animals (the animal hoarding episodes are the best). In each episode a team is brought out to the property to help clean up and declutter. Animal Control will visit if animals are involved to make sure the animals aren't suffering and are being properly cared for. Often times Adult Protective Services enters the picture and deems the home "unlivable." 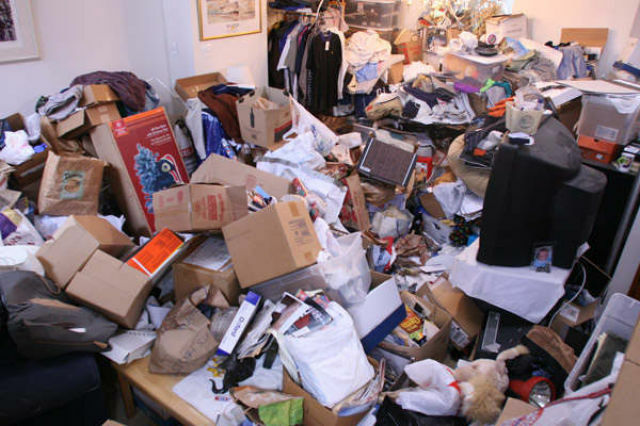 When this happens, if the property isn't cleaned to a certain standard, then the homeowners can be evicted. It is at this point that I get annoyed. One guy hoarded 2,000 pet rats. The condition that these people live is beyond nasty and ridiculous. However. If they own the property (and are not renting) then I feel how they live in their "home" is their own business. If a tower of trash falls on them one day and kills them, then so be it. If minors are involved, then of course, the home must be safe. Animals should be cared for as well. I don't condone the mistreatment of animals. But if the home is only occupied by adults, then the condition of the residence should be of no concern of the city government. It is a waste of tax payers' money to send officials out to nasty homes (that don't house children) and threaten the owners with eviction. If someone loves living in trash and cat feces, then that's their choice and they should have that right. I feel it's just not right to tell people how to live in their own homes. If their filth and junk piles aren't hurting anyone else, then what's the problem? Some of the hoarders live in neighborhoods, so I can understand neighbors not wanting bugs from a nearby trash laden house to come next door and infest their own home. But a lot of the people on this show live out in the country. They have no neighbors or neighborhood association. Why does the condition in which they keep their home have to be regulated?? Whose business is it how these hoarders (or anyone for that matter!) choose to live their lives? Yikes! I don't think I could watch that show! Esp. with the pets...how sad. But I agree that the gov't shouldn't tell people how to live. But at the same time, this is a disease that often requires therapy and treatment. And the gov't may be able to help them with that as well. I watch this all the time! I hear where you're coming from with it being a waste of taxpayer money to send in officials, but if a neighbor complains, or if the hoarder has a bunch of crap in their yard bringing down property values, then I think their problem is effecting other people and needs to be dealt with. Every time I see that show, I have to go clean something! I agree to a point, but, if the filth goes unchecked long enough and gets bad enough it can become a public health concern, imagine what bacteria, disease and other nastiness may be lurking down under all that mess... otherwise there might be a special edition, "Hoarders: Bubonic Plague Revisited"
I have seen that show. Unfortunately I know someone personally who lives like that. We worry more about their health than anything.